Turpentine — Dilutes oil color to a thin, quick-drying wash in the early stages of painting. It can also be used to clean oil paint from brushes. 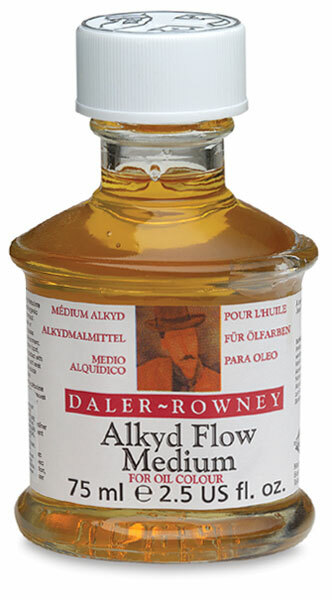 Alkyd Flow Medium — Slightly thinner than Alkyd Gel, Alkyd Flow Medium reduces drying time and increases the transparency and flow of oil color, allowing paint to be brushed out more smoothly. Poppy Oil — This is a clear oil medium to mix with and reduce white and lighter colors, and to enhance gloss and flow. Although it is less inclined to yellow than linseed oil, it also dries slower. Using Poppy Oil in too high a proportion retards thorough drying. Low Odor Thinner — This is a low odor alternative to turpentine, ideal when working in a confined space or for those artists who find turpentine’s odor too strong. It can also be used to clean palettes and brushes. Artist’s Clear Picture Varnish — This is a removable clear picture varnish, used to achieve a clear, even gloss that will not yellow or bloom. A light aerosol application results in an excellent retouching varnish. It can be used on both oil and acrylic paintings. Damar Varnish — This is a removable picture varnish that, when applied thinly, will lend a low gloss. It dries hard and clear within a few hours, and is removable with turpentine or white spirits. Matte Varnish — This is a removable, non-yellowing varnish that dries to a matte finish. It can be mixed with Artist’s Clear Picture Varnish to achieve a range of semi-gloss finishes. It can be used on both oil and acrylic paintings, and is removable with turpentine or white spirits. Purified Linseed Oil — This oil reduces the consistency of oil color and slows down drying time. In its raw state, it gives color a high gloss. When diluted 50/50 with turpentine or Low Odor Thinner, it creates an excellent medium for most types of painting. Retouching Varnish — This versatile varnish is used to bring back the original paint quality of dry or dull oil paints. When reduced with solvents, it is much thinner than final top coat varnishes. Linseed Stand Oil — Use to reduce the consistency of oil colors, enhance flow, and reduce brush marks. Viscous and faster-drying than pure linseed oil, Linseed Stand Oil dries slowly to a tough, elastic film.